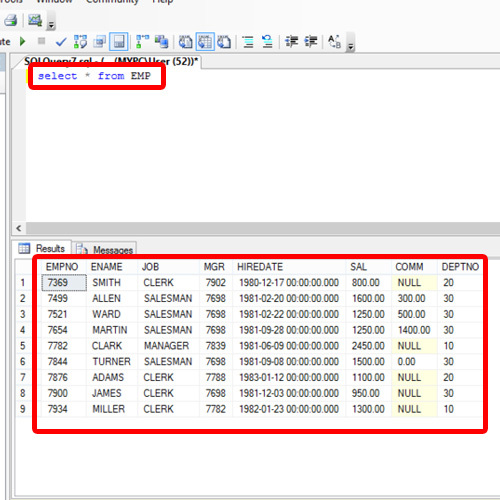 A transaction in SQL is basically the process of one or more changes being made in the database. The Commit command is used to save the changes made in the database. To see its implementation, start by first beginning the transaction. 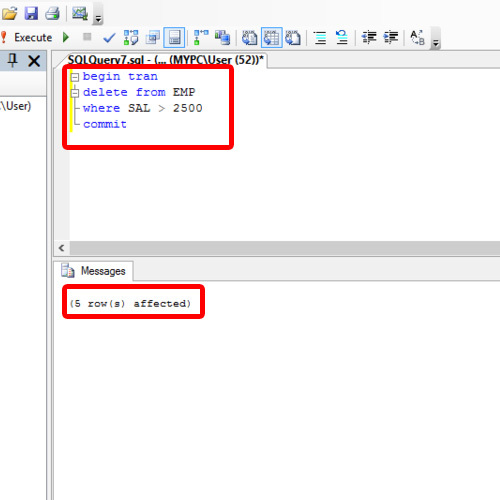 Before starting any Transaction in SQL, we have to write the Begin Transaction statement. After that, write the actual action which is required, for example delete from the employee table, where the salary is greater than $2500. After that, write the Commit keyword which confirms that the query is logically correct and can be executed. Now when we run the query, a message appears below the Query Editor which shows the number of rows that have been affected by our query. After that, fetch all the records from the employee table and it can be seen that all the records which have a salary above $2500 have been deleted. Now let’s examine the SAVE POINT command. To understand the concept, we will take an example of a departmental table. Start writing the query by beginning a transaction and then entering in the “Save Transaction” command followed by the transaction name. After that, let’s delete a record with the Department number as 10 and then again save the transaction. This time, define the save point as point2. With that done, delete another department, and save the transaction, defining it as point3. After executing it, 2 rows would get affected. Now, see the department table to view the changes. For that, let’s fetch all the records from the table. It can be seen that department “10” and “20” has been deleted from the table. If we want to track back to the previous changes, we can use the save points created earlier along with the Rollback transaction command. The rollback transaction allows us to remove all the modifications made to the data, either from the start of the transaction or to a defined save point. 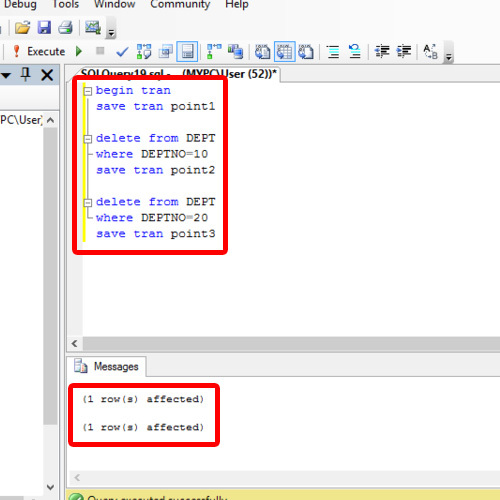 For that, we will use the rollback transaction statement and define the save point after that. Over here, let’s roll back to point number 2. 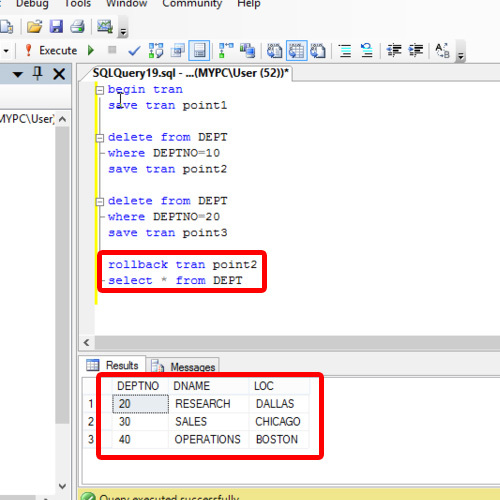 Once we execute the query, and fetch all the records from the table, it can be seen that the table now contains the data up till point number 2 in the query. 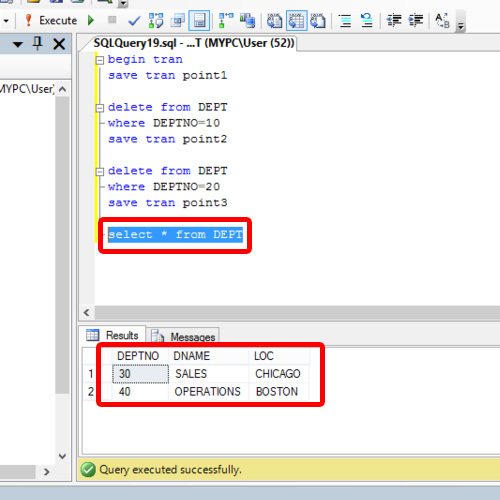 And this is how we can use Transactions in SQL.